No, not that president! I mean Matt Croson, the new president of the American Gear Manufacturers Association, who started in June and has been busy getting to know the gear industry and AGMA's members. More than 100 years ago, gear manufacturers were facing a significant challenge from industry. The incredible advances in industrialization and transportation that occurred at the turn of the 20th century resulted in incredible growth for gear makers, but there were significant technical issues. "The lack of process and product standardization was a continuing problem in all U.S. industry. The lack of industry-wide gear standards meant there were no standard gear tooth sizes, ratings, quality definition or consistent manufacturing methods" (Celebrating 100 Years of Gearing, pg. 22). While the two have taught a variety of AGMA courses over the years, without question their most popular courses are Gear Failure Analysis (Errichello with longtime colleague Jane Muller) and Gearbox CSI: Forensic Analysis of Gear & Bearing Failures (Drago). Drago currently teaches Manufacturing & Inspection (with AGMA instructor Joseph W. Lenski, Jr.) and Gearbox System Design: The Rest of the Story - Everything but the Gears and Bearings (with AGMA instructor Steve Cymbala) as well. If you haven’t already done so, you should make plans to attend Gear Expo in September. It’s a unique and important show, and you should take advantage of it. The AGMA/ABMA Annual Meeting took place April 10-12 in St. Petersburg, Florida. Between committee meetings, networking opportunities and social events, many individuals in the gear industry were presented awards. 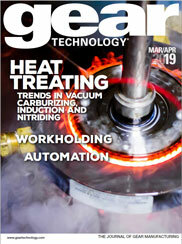 This issue, GT Extras brings you "Heat Treat and Induction Hardening of Industrial Gears," a treasure trove of heat treating related technical articles and a call for help in preparation for AGMA's 100th anniversary. How should we consider random helix angle errors fHβ and housing machining errors when calculating KHβ? What is a reasonable approach? When I first met the leaders of the gearing industry in April 2016 at AGMA's 100th Anniversary Celebration, I did my best imitation of Joe Namath, who famously predicted a Super Bowl victory for his New York Jets: I guaranteed we would reach our 101st year! I’ve just come back from the AGMA annual meeting in Napa, California, where I had a great time visiting with friends and colleagues in the gear industry. As always, the annual meeting was a great opportunity to network and meet with other AGMA members. At the AGMA annual meeting last month, the association presented me with its Distinguished Service Award. At most family reunions, everyone gets along, everyone puts on a good face, and everyone celebrates their togetherness. The AGMA annual convention held at the end of April was a lot like that. I have a query (regarding) calculated gear life values. I would like to understand for what % of gear failures the calculated life is valid? Is it 1-in-100 (1% failure, 99% reliability) or 1-in-one-thousand (0.1% failure)? The definition is pretty straightforward: An association is an organization of persons having a common interest. Basically, it's a group that shares a purpose or mission that exists for the mutual advancement of its members. Will tariffs and quotas affect your ability to operate in the fourth quarter this year? There are many different gear rating methods in use today, and they can give substantially different results for any given gearset. This paper will make it easy to understand the choices and the impact the choices have on gearbox design. Eight standards are included - AGMA 2001; AGMA 6011; AGMA 6013; ISO 6336; API 613; API 617; API 672; and API 677. (Click HERE for the Appendix to this article). Bob Errichello retires from teaching, Siemens expands technical center, HBM Holdings acquires Schafer Industries, plus new hires and other industry news. Gear Expo 2017 is your best opportunity to expand your knowledge, get answers to your technical questions and solve your toughest manufacturing challenges. The reason is quite simple. Gear Expo provides you with the greatest collection of gear expertise, know-how and experience you can find. Faydor Litvin, 1914-2017; Michael Goldstein receives AGMA Distinguished Service Award. In today’s globalized manufacturing, all industrial products having dimensional constraints must undergo conformity specifications assessments on a regular basis. Consequently, (standardization) associated with GD&T (geometrical dimensioning and tolerancing) should be un-ambiguous and based on common, accepted rules. Of course gears - and their mechanical assemblies - are special items, widely present in industrial applications where energy conversion and power transmission are involved. There are many benefits to attending Gear Expo, but if you're not taking advantage of the educational opportunities, you're missing out. AGMA Sets Up Shop in Living Laboratory of the Midwest. Columbus, Ohio recently surpassed Indianapolis as the second largest city in the Midwest behind Chicago, according to the United States Census Bureau. This could change come the 2020 census, but there's no denying Buckeye Nation is going places. Summer never lasts as long as you want it to. By the time you read this, you'll be well into the hazy, lazy days, and the season will be gone before you know it. That means you're running out of time to make plans to attend our industry's most important event. Of course, I'm talking about Gear Expo (October 24 - 26) and the AGMA Fall Technical Meeting (October 22 - 24), both of which will take place in Columbus, OH. A recap of the AGMA 2010 Fall Technical Meeting. AGMA Chairman David Ballard discusses what it means to be an AGMA member. Dr. Phil Terry, chairman of the AGMA Technical Division Executive Committee, talks about the standards-making process. When you graduated from school and made your way into the world, you probably thought you’d learned everything you needed to know to be successful. But those of us who’ve been out in the workforce for some time know that you never stop learning. Chairman Todd Praneis of Cotta Transmission describes the activities of AGMA's Enclosed Drives technical committee. AGMA Flexible Couplings committee chairman Glenn C. Pokrandt gives an update about standards and other documents under development. At a time when there are many pressures on the Gear Industry and its representative Association, the American Gear Manufacturers Association, it seems particularly appropriate that Gear Technology - The Journal of Gear Manufacturing appears. AGMA is particularly pleased to have the opportunity to write the first editorial for this magazine. The AGMA Fall Technical Meeting provides an opportunity to share ideas with others on the design, analysis, manufacturing and application of gears, gear drives, and related products, as well as associated processes and procedures. AGMA president Joe T. Franklin Jr. talks about how the AGMA Gear Expo has grown and changed since its beginnings as a table-top show in 1987. The world is full of acronyms. At work, the inbox reveals e-mails from the AWEA, SAE, MPIF and AMT. On the weekends, Saturday mornings are consumed by activities involving the AYSO, PTA, YMCA or DMV. It’s a struggle to determine what organization does what and why we should care in the first place. Step forward now to help yourself and your industry. Gear Technology talks with AGMA's president about the association and its role in the gear industry. “The gear marketplace is a global marketplace.” Bill Bradley says it easily, with no special emphasis. The vice president of AGMA’s technical division sees the statement as an obvious fact. As the international business community grows closer together, the need for understanding differences between national and international gear rating standards becomes increasingly important for U.S. gear manufacturers competing in the world market. Events from SME and AGMA, along with news from the gear industry. "One of the reasons AGMA has been successful over our 93-year history is that the association’s agenda, programs and activities reflect the voices of our members," says Joe T. Franklin, Jr., AGMA President. The AGMA pavilion was a hot spot at October's PTC-Asia show in Shanghai, as evidenced by the intense quoting reported by exhibitors. Despite the many things being done to promote manufacturing nationwide, there still remains an acute need for gear-specific training, remedial or otherwise. Listing of papers to be presented and activities for the 2007 AGMA Fall Technical Meeting. The organizers of Gear Expo 2007 promise to combine the most popular features of shows past with some innovations for this year’s attendees. By the time the show closes on October 10, the association hopes its targeted 175 exhibitors walk away with new insights leading to profitability and renewed contacts. A change has taken place within the industry that is going to have an enormous effect on the marketing, sales, and purchasing of gear manufacturing and related equipment. This change was the American Gear Manufacturers' Association, first biennial combination technical conference and machine tool minishow. The American Gear Manufacturers Association (AGMA) is accredited by the American National Standards Institute (ANSI) to write all U.S. standards on gearing. However, in response to the growing interest in a global marketplace, AGMA became involved with the International Standards Organization (ISO) several years ago, first as an observer in the late 1970s and then as a participant, starting in the early 1980s. In 1993, AGMA became Secretariat (or administrator) for Technical Committee 60 of ISO, which administers ISO gear standards development. Long-time readers of these pages will know that I have always felt strongly about the subject of professional education. There's nothing more important for an individual's career development than keeping up with current technology. likewise, there's nothing more important that a company can do for itself and it employees than seeing to it they have the professional education they need. Giving people the educational tools they need to do their jobs is a necessary ingredient for success. One of the best ways to learn the ISO 6336 gear rating system is to recalculate the capacity of a few existing designs and to compare the ISO 6336 calculated capacity to your experience with those designs and to other rating methods. For these articles, I'll assume that you have a copy of ISO 6336, you have chosen a design for which you have manufacturing drawings and an existing gear capacity calculation according to AGMA 2001 or another method. I'll also assume that you have converted dimensions, loads, etc. into the SI system of measurement. This is the third article in a series exploring the new ISO 6336 gear rating standard and its methods of calculation. The opinions expressed herein are htose of the author as an individual. They do not represent the opinions of any organization of which he is a member. It's nice to see old friends. It's also advantageous to make new ones. Gear Expo has always been a family reunion of sorts, but it's first and foremost an opportunity to show off the latest and greatest technologies that are impacting the gear industry today. With this in mind, Gear Technology recently spoke with those responsible for putting the Fall Technical Meeting (FTM) and Gear Expo 2013 together in Indianapolis. Another year, another AGMA Fall Technical Conference. But this is no ho-hum event. Not when every year, the conference attracts some of the greatest mechanical engineering minds on the planet, along with representatives of the world’s greatest manufacturing entities. And who knows—perhaps one day there will be an extraterrestrial contingent—the science is that good. And all of it readily applicable to real-world manufacturing. AGMA925–A03 scuffing risk predictions for a series of spur and helical gear sets of transmissions used in commercial vehicles ranging from SAE Class 3 through Class 8. The major focus of the American Gear Manufacturers Association standards activity has been the accurate determination of a gearbox's ability to transmit a specified amount of power for a given amount of time. The need for a "level playing field" in the critical arena was one of the reasons the association was formed in the first place. Over the past 85 years, AGMA committees have spent countless hours "discussing" the best ways to calculate the rating of a gear set, often arguing vigorously over factors that varied the resulting answers by fractions of a percentage point. While all that "science" was being debated in test labs and conference rooms all over the country, out industry's customers were conducting their own experiments through the daily operation of gear-driven equipment of all types. A study of AGMA 218, the draft ISO standard 6336, and BS 436: 1986 methods for rating gear tooth strength and surface durability for metallic spur and helical gears is presented. A comparison of the standards mainly focuses on fundamental formula and influence factors, such as the load distribution factor, geometry factor, and others. No attempt is made to qualify or judge the standards other than to comment on the facilities or lack of them in each standard reviewed. In Part I a comparison of pitting resistance ratings is made, and in the subsequent issue, Part II will deal with bending stress ratings and comparisons of designs. AGMA introduced ANSI/AGMA 2015–2–A06— Accuracy Classification System: Radial System for Cylindrical Gears, in 2006 as the first major rewrite of the double-flank accuracy standard in over 18 years. This document explains concerns related to the use of ANSI/AGMA 2015–2–A06 as an accuracy classification system and recommends a revised system that can be of more service to the gearing industry. It is often easy for those outside of the gear industry to get the impression that nothing is changing in our business. After all, all illustrated bimonthly by the covers of this very journal the making of gears has been with us for centuries. However, nothing could be further from the truth. For the last few years, the market has been tough for the U.S. gear industry. That statement will cause no one any surprise. The debate is about what to do. One sure sign of this is the enormous attention Congress and the federal government are now placing on "competitiveness." The authors of last issue's article comparing AGMA, ISO and BS methods for Pitting Resistance Ratings are commended. Trying to compare various methods of rating gears is like hitting a moving target in a thick forest. The use of different symbols, presentations, terminology, and definitions in these standards makes it very difficult. But the greatest problem lies with the authors' use of older versions of these documents. ISO drafts and AGMA standards have evolved at the same time their work was accomplished and edited. In Part I differences in pitting ratings between AGMA 218, the draft ISO standard 6336, and BS 436:1986 were examined. In this part bending strength ratings are compared. All the standards base the bending strength on the Lewis equation; the ratings differ in the use and number of modification factors. A comprehensive design survey is carried out to examine practical differences between the rating methods presented in the standards, and the results are shown in graphical form. AGMA has an excellent Training School for Gear Manufacturing. It's a great product providing a great service to the gear industry. Thus far we've educated 117 employees from 71 companies; students range from new hires with no experience to company presidents. Essentially every class since December, 1992, has been sold out. With all the heated debate and hoopla surrounding ISO 9000 certification, everyone seems to have an opinion about whether to sign up. Executives in the gear industry are flooded with information and ideas that often seem at odds. Gear Technology asked AGMA executive director Joe T. Franklin, Jr. to give an industry perspective on the pros and cons of ISO 9000 certification. A few months ago at the AGMA management seminar, I was surprised by the feverish note taking that went on at a presentation on marketing. The sight reminded me that while many of us in the gear industry are good engineers, designers, and mangers, we are often not as familiar - or comfortable - with less concrete concepts, such as marketing. Five years of effort by AGMA came to fruition in January with the publishing of a report from the Department of Commerce. This "National Security Assessment of the U.S. Gear Industry" indicates that if serious measures are not taken, the gear industry's future is in jeopardy. It also sets the tone for confronting major challenges now looming large in our industry. The new chairman of the AGMA Technical Division Executive Committee explains what's involved in the process of developing technical standards at the AGMA.